The attraction with Acer’s new tablets is undeniably great taking into consideration the aggressive price point they’re tackling, but there’s still always that problem of having to keep up with the strenuous demand. Acer is undoubtedly a big time player in the computer business, but now that they’re focusing a lot of attention in the tablet market, they’ll need to keep pace in order to blossom into a sizable opponent in this competitive new market. Interestingly enough, Acer’s part suppliers have hinted that they’re seeing stronger than expected sales with Acer’s ICONIA TAB line, albeit, production at this point might limit potential shipments. In fact, it’s more than “likely” for Acer to ship 1 million units of its Android-based tablets in the spring, but the issues boil down to Acer’s former CEO Gianfranco Lanci refusing to hire non-Taiwanese engineers to step up ICONIA TAB deliveries. Looking into the numbers alone, Acer saw 300,000 tablets shipped in April, which 70 percent consisted of its ICONIA A500 and Windows powered W500 models. As for the rest, shipments seem to mainly come from its ICONIA SMART phone and tablet hybrid. 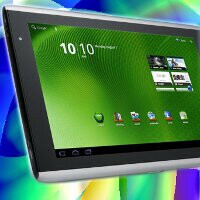 And of course, we all know at this point that they’ve delayed the release of their 7-inch model – the ICONIA TAB A100. For some reason the Acer has not been marketed much; and it doesn't appear to have the same fame as the Xoom or Trasnformer. I think there are a lot of people purchasing the Acer tab because they were tired of waiting for the Transformer to become available.